Many table games were played in the Renaissance home, often after dinner. Men and women, both old and young, enjoyed these forms of sociable play together. They ranged from traditional games – such as backgammon and chess – to new types, which often involved gambling. This was prohibited or regulated by the authorities because of the large sums of money involved. A popular, though illegal, game played in the home was a type of lottery known as biribissi. Thanks to the invention of printing in the fifteenth century, games such as this were easily disseminated in cheap versions printed on paper. This example has 63 squares corresponding to the same number of tickets below, which are ready to be cut up. The players bet a sum of money on a figure in the hope that it would be drawn. This complaint comes from one of the speakers in Erasmus’s dialogue on ‘Knucklebones, or the game of tali’. 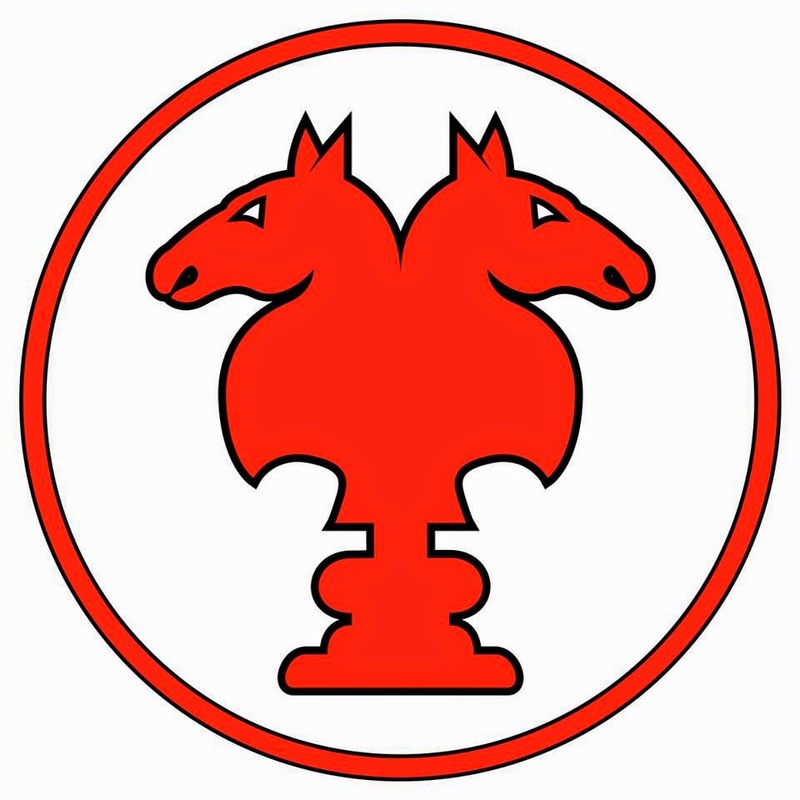 He would have easily recognised the sheet of playing cards, printed from a wooden block, with the knave (or jack) of hearts and the knave of diamonds repeated alternately. The figure of the ‘knave’ originally meant ‘a son’ and had no negative connotations at the time. It was only later that it came to mean a rogue. 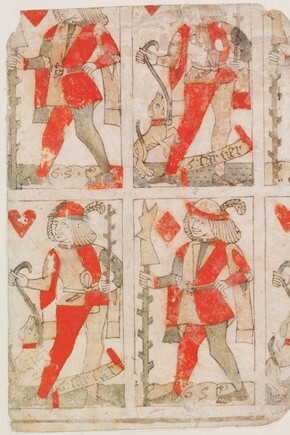 The sheet dates to the late 15th century and shows two of the four suit signs that had been adopted by French card-makers by this date, the same spades, hearts, clubs and diamonds that are in use today. The cards are marked with the initials G.S.C. and G. Cartier, which suggest that the artist was Giles Savouré (also known as ‘Cartier’ or ‘Cardmaker’ in French), who worked in Lyons from about 1480 to 1506. This survival of the artist’s name is very unusual as playing cards were ephemeral objects that became bent and dirty through use and were eventually thrown away. When card games arrived in Europe in the early 14th century, they were at first the preserve of the well-to-do because the cards were hand-painted and subsequently expensive. However, the advent of woodblock printing led to a system of relatively cheap mass production, in which cards could be printed in sheets from a single wood block. As a result, card playing became exceedingly popular with both men and women and at all social levels – so much so that a Paris decree in 1397 forbade people to play at ‘tennis, bowls, dice, cards or ninepins on working days’, while Henry VII of England (reigned 1485–1509) forbade servants and apprentices from playing at cards except at Christmas. Preachers, theologians and moralisers all railed against their use. In Bologna in 1423 the Franciscan friar, and later saint, Bernardino da Siena preached so successfully against gaming that the people threw thousands of cards onto a great bonfire in the public square. Part of an uncut sheet of playing cards by Gilles Savoure. Lyon, 1490. Despite these strictures, gambling was still a widespread pastime. Furthermore, playing for fun, rather than for money, was not condemned, so cards themselves did not attract censure. Indeed, when the 15th-century artist Antonio Cicognara painted a set of tarot cards (used for gaming rather than divination) and presented them to Cardinal Sforza, the Bishop of Pavia and Novara, the cardinal evidently felt no moral qualms in asking the artist to make similar packs for his sisters, who were nuns in the Augustinian convent in Cremona. Women were often avid card players. Parisina Malatesta, the young Duchess of Ferrara, ordered an expensive hand-painted pack for herself in 1423, and a year later sent off for two cheaper packs for her little twin daughters, Lucia and Ginevra. That women often gambled with money is also clear. Mary Tudor (1516–58), daughter of Henry VIII of England, and later Mary I of England, ran up substantial debts due to her constant card playing, while the pious archduchess Johanna of Austria seems to have enjoyed better luck in the popular French card game of piquet.